The required accommodation for visitors has not been made so far though not much time is left for the Commonwealth Games. The DDA has recently cancelled the allotment of five hotel sites as hoteliers failed to start construction within the given time, sources said. In an attempt to cater to the needs of disabled children, the Central Board of Secondary Education (CBSE), for the first time, has designated educators to answer to the queries of disabled students taking Class 10 and Class 12 exams. With the board exams beginning from March 2, examination stress is already building up among students. Aman Chawla (name changed), a student of DPS Noida, has shut himself in his room and comes out only for toilet. He is so involved in his studies that he sometimes even skips his meals. His parents are very happy with his hard work and think that long hours of study will help him fetch good marks in his board exams. Pull out those woollens again, because after days of experiencing warm weather, Delhi will again witness a cold spell, according to the meteorological department. There is a belief among the cognoscenti that art never ages if it is expressed with truth and conviction. And even the entry of newer forms of art or technology cannot dilute the magic of purity that emerges from true art. If you are a daily interstate commuter and are relieved that the much awaited Reciprocal Common Transport Agreement among governments of Delhi, Haryana, Rajasthan and Uttar Pradesh for unrestricted movement of taxis and autos in the National Capital Region (NCR) has finally been signed, then you are in for some disappointment. Some unknown persons robbed the car of an industrialist at gunpoint near Park Plaza in sector-55 last evening. Besides, two cases of snatching were reported from different places in Noida yesterday. A B.Pharma student committed suicide at Gamma Sector in Greater Noida. As per suicide note recovered from his room, failure in love was the cause of his committing suicide. A modern head post office was inaugurated here yesterday. A GPS-based mail delivery van was also flagged off. The south district police has arrested the absconding woman kingpin, Infizar Imomova, popularly known as Laila, for the prostitution racket operating in Delhi and NCR region. She is an Uzbeki national. The Delhi Legal Service Authority’s (DLSA) initiative to dispose of nearly 1,00,000 cases of bad cheques and loan-related disputes received a mixed response from litigants. Nearly 12,000 cases were successfully negotiated today, officials said. All deputy general managers (DGMs operations) of the Dakshin Haryana Bijli Vitran Nigam (DHBVN) will organize ‘open darbars’ at 71 places during this month. Two CNG stations were set up in Greater Noida, while the CNG project for Noida was held up. The government has estimated that 25,000 visitors would come to the national capital during the Games for which thousands of rooms are required. The government has also announced a bread and breakfast policy permitting general residents to have paying guests. Delhi Hotel Mahasangh president Ajay said that the requirement of rooms would be met provided the hoteliers were encouraged by the government. At present, they are not permitted to construct more than three-storeyed buildings. Land should be provided to them on subsidized rates. He said that the luxury tax rate is 12.5 per cent. It should be reduced to four per cent. He added that the land for hotels is very costly. If the Delhi government makes an arrangement for loan, it will be easy for the industrialists to construct the hotel buildings within the given time. General secretary, Hotel and Restaurant Owners Association, Sanjeev Khurana said that the government policy was discouraging hoteliers from taking up the construction work of new hotel buildings. It should make amendment in the master plan increasing the building floor area ratio. The DDA is allotting hotel sites at a huge cost with a condition that there should be budget hotels. After spending a fortune, no businessman can provide rooms at the rate of Rs 1,000 for 24 hours. Khurana said that hotel owners met the tourism secretary for certain concessions, but he has done nothing so far. Four special educators— three from Mumbai and one from Delhi— will help students and parents overcome anxiety and stress during the board exams. The special educators are available online as well as on telephone from centres located in Mumbai and Delhi from February 1 to April 2. However, educators feel that maximum queries would start coming about 15 days before the exams. “The basic idea is to make the child feel confident of taking the exams despite their disability. I try to ease the extra pressure on them by making them feel comfortable about the exams and then counselling them on their specific requirements. Children with special needs require patient handling and often a good amount of attention and this is precisely what we try to give them,” said one of the educators. Special educators are extremely attentive and polite while dealing with disabled children. They also try to talk to the parents and inform them about the facilities provided by the CBSE to such children. The CBSE offers certain concessions to physically challenged, spastic and dyslexic candidates taking the month-long board exams. These concessions include extra time (60 minutes extra to write the exam), a writer and flexibility in selecting subjects at the secondary level. The CBSE has also given special training to teachers on the marking criteria for such children. Another counsellor added that disabled kids tend to be very vocal and there is a need to understand their gifted abilities. Sometimes it can be difficult to completely understand the child on telephone. The helplines for the disabled kids are: Abha Sharma, Mumbai, 9967800337; M.R Shipley, Mumbai, 9833950896; Hetal Sayla, Mumbai, 9819209623 and Shweta Khanna, Delhi, 9717882074. For online counselling, kids or parents can visit CBSE’s website www.cbse.nic.in. However, Aman has sadly gone into depression, said Dr Deepak Gupta, child and adolescent psychiatrist, during a workshop held at Sir Ganga Ram Hospital. His mother says that Aman doesn’t sleep and does not want to talk to his friends and family members. Experts say, “Isolation and skipping meals are one of the first symptoms of depression. This is a crucial stage, but can be handled easily if proper guidance is provided to the child at the right time. Parents should try to involve their children in meditation or yoga and should maintain a healthy, cheerful atmosphere at home rather than converting homes into a hospital ICU”. “To curb the tension and keep stress levels under control, students must take 10-30 minutes of break after every 40-50 minutes of continuous study. During the break time, they should play outdoor games. Sports are a form of physical exercise which helps the body produce hormones like oxytocins. These hormones act as a relaxation therapy for the body and mind against the stress experienced while studying,” explains an expert present at the workshop. “Break is very important because long hours of study defocus the mind and hence knowledge or ideas gained don’t sink in after a certain period of time. Taking a break helps rejuvenate and refocus,” adds a teacher of Green Valley School. Making children study in groups is another interesting idea that finds favour with the experts. With schools mounting pressure on students and parents creating a curfew like situation at home, child tends to become dull and looses mental stability, says a doctor. “The western disturbances from the north that had cast the dry warm spell over Delhi have passed. The weather is likely to return to normal cold temperatures,” an official at the Safdarjung meteorological office said. The minimum temperature recorded on Sunday morning was 8.6 degrees Celsius while the maximum was a comfortable 23 degrees Celsius. “This is normal,” the official said. Unlike Saturday’s 23 degrees Celsius, Friday’s maximum touched a warm 28 degrees Celsius. This was an indication that the winter was ‘back on track’, the official said. Sunday morning witnessed a shallow mist, but this cleared up later in the morning. “Visibility was 4,000 metres at 9 am,” the official informed. The world-renowned French photographer Bernard Faucon, who gave up photography in 1995 because he was ‘convinced that it was over and that this period in the history of photography to which he had subscribed, “photographic staging” or “photographic settings” had come to an end.’ He also felt that ‘it was the swansong of photography, the last stage before the reign of pure, digital advertising images. It was a time when one still believed sufficiently in the power of truth of photography, when one could permit oneself the luxury of creating “true fiction”. The works of this cameraman are being presented in a special exhibition in the capital by Alliance Franaise de Delhi and the French Embassy to showcase his retrospective selection photographs in Galerie Romain Rolland. The exhibition opened on February 3 and will continue till February 12. The Dramatics Club of Ansal Institute of Technology, Gurgaon staged a play “Yaad Karo Qurbani” at Kamani Auditorium here last week. The play was written by Anees Azmi and is based on the Jallianwala Bagh Tragedy. The play vividly captured the Punjab of 1919. The narrow streets and mohallas of Amritsar, the curfews, the freedom slogans, the defiance of the young freedom fighters was poignantly evoked during the course of the play. What was remarkable about the play was that the AIT students have been able to not only identity themselves with the characters in the play but also empathise with the reigning sentiments of the period. The play was directed by Ajay Manchanda, who has been associated with National School of Drama (NSD) and Urdu Academy for many years. He had directed more than 50 plays and conducted numerous theatre workshops for children. As a way of paying tributes to the innocent martyrs who sacrificed their lives in Jallianwalan Bagh, this play relives the tragic day once again. Important guests included Prof. Sudhir Mehta, Associate Vice-President (Academic Affairs), North Dakota State University, USA and Prof. Subhash Saxena, Distinguished Emeritus Professor of Coastal Carolina University, USA. Prof. Sudhir Mehta gave away the certificates and souvenirs to all students who have participated in the play. According to Prof M.P.Singh, director, AIT, the dramatics club of AIT is an earnest initiative to tap and showcase the talent of its students. He further said that it is a mean to provide a platform to the student to express themselves creatively. Apart from this the dramatics club also stages plays during college cultural annual festival. An exhibition of paintings on Nandi (The Bull) series by artist Sarthak is being held at the Fortune Art Gallery on MG Road in Gurgaon from February 20 to 26. Sarthak is one of India’s celebrated artists, acclaimed for his contemporary works. His paintings carry the insights of his artistic journey. Sarthak has a great love for the people of India and mythology and reveals his reflections in oil, water, pastels, charcoal, ink each medium brilliantly indicating the contentment, exhilaration, tranquility and mystical musical notes, flowing through his canvas. In “Nandi (The Bull) series”, one of his latest series of paintings, meticulously done over a period of two years, the artist has tried to capture various forms of Nandi the symbol of power. “Various features and myths of Nandi inspired me to work on the theme and I’ve tried to depict its various moods and forms,” says the artist. Sarthak has been intensely passionate about art since his early teens and has honed the fundamentals of fine art with immense perseverance, over the years. He has been painting on a variety of themes for more than 15 years and through his commendable series of contemporary works on Rajasthan, tribals, mythology, nandi, women, Sundarbans etc., Sarthak brings to us, the artistic interpretation of his most intimate feelings on the true essence of India. His works also have a global message, a global appeal they appeal to the human spirit of the world. Sarthak does not see himself as a creator but rather an interpreter of God’s creations and endeavors to bring this insight, to all. The Hungarian Information and Cultural Centre here is holding a children’s painting competition at its premises on February 13. 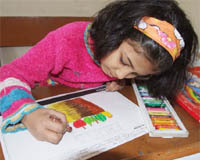 Students of a large number of Delhi schools are expected to participate in the competition. Indian Council For Cultural relations (ICCR) and the Ameer Khusro Centre For Music Here are jointly organising a “Friendship Concert”, an evening of classical music, at the Kamani auditorium here on February 10. On February 9, the IICR and the Embassy of the Arab Republic of Egypt are presenting “Ismailia Folk Dance” at the Kamani Auditoruium. Manjari Chaturvedi, a known exponent of classical dance is presenting “Beyond Boundaries”, a Sufi kathak recital, at the Kamani Auditorium here on February 12. She will be accompanied by spiritual musicians from Iran, Qawwals, from Avadh and classical musicians from Lucknow and Delhi. The India International centre here is presenting “Out of Blue”, an exhibition of the recent works of artist Padmini Mongia at the IIC Gallery from February 15 to February 22. This is because almost more than a month has passed since the agreement was signed, but no taxis or autos yet have the permit to ply as per the agreement. In fact, the fact of the matter is that autos and taxis with such permits may take around eight months to one year to come to roads. Moreover, most of the auto and cab drivers say that they are yet to receive any information from the government about these permits. According to cab driver Ranjit Singh, “It is not surprising if it may take a few more weeks, may be months or a year for this to materialize, as till now we have not been informed even about the procedures of filling applications for such permits”. Also, in 1966, the Delhi government had filed a petition in the Supreme Court to limit the number of autos plying in Delhi. The apex court had then ruled that only 55,000 autos will be allowed to ply in the Capital. But with the Reciprocal Common Transport Agreement coming into force, the number of autos will increase to around 67, 000, as according to a recent notification 4,000 autos and radio cabs from the four states will commute to and fro and hence violate the Supreme Court’s order by increasing the number of autos running on Delhi roads. “Moreover, these vehicles will be given a particular colour code too and before being issued, the permits will have to be get signed and registered with the transport department,” he added. Meanwhile, officials from transport department say that they are still looking into the notification and are planning proper ways to implement it effectively. However, a bigger issue which is yet to be sorted out is the division of tax. This means which state will get how much tax each time a vehicle crosses the border. For instance, an auto going to Gurgaon from Delhi will have to pay tax to government of which state, Delhi or Haryana. Moreover, another facing the move is that satellite towns like Gurgaon, Faridabad and Ghaziabad have a huge fleet of autos that run on petrol, but the number of CNG-fuelled autos is too low. While the agreement says that UP and Haryana can permit a maximum of 8,000 CNG autos to ply across NCR freely, the reality is that they don’t have even one tenth of that number right now. The present scenario of interstate travel is pathetic. Cabs, autos and taxis are either barred from crossing certain state boundaries or have to pay a hefty tax every time they cross the border. Restrictions on the movement of buses across the borders have further worsened the situation. Most of the auto drivers and cab drivers plying interstate say they have not received any update about these permits. “I heard about the free permit notification. It will not only help us, but will reduce the cost of traveling for daily commuters too. However we are yet to receive any update on it,” says Ashutosh Shukla, an auto driver. Driver Janeshwar Prasad said that some unknown persons overpowered him near Park Plaza and took control of the steering at gunpoint. They then speeded towards Khoda Colony. They pushed him out of the car some hundred meters away from Park Plaza and fled away with it. “We are investigating the case from the robbery angle too,” said Pritam Pal Singh, SHO of sector-58 police station. In the first case of snatching, Chander Prakash Bhatia, a resident of sector-34, lodged a complaint at sector-24 police station. He stated that two bike-borne youths snatched his purse while he was passing through the area with his wife. Rs 250 cash, bank cards and important papers were in the purse. While in another such case, Ashish Kumar of Muzaffarnagar said that his purse was snatched in sector-22 last evening. He had come to Noida to visit a relative. “We are experiencing long erratic power cuts. If the electricity supply is so bad at this stage when the population is far less, what will happen if more people come to the city?” she asked. “Power supply is very erratic and there is no proper firefighting facility. Due to chain and mobile snatching incidents, female employees avoid working at Greater Noida units,” said Aditya Ghildiyal, president, Association of Greater Noida Industries. “We do not go out of the hostel alone for fear of eveteasing as rowdy boys roam around the colleges,” complained a student Nidhi Verma. “There is no shopping complex in Greater Noida. 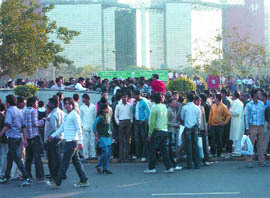 We have to go to Noida to do shopping on weekends,” said another student Mohit Bhandari. Meanwhile, chief executive officer Pankaj Aggarwal assured the residents of better civic amenities and improvement in power and water supply and said that the Authority has taken measures for the redressal of the grievances of residents. “In the second suicide note addressed to his parents, he wrote he was unable to come up to their expectations and always acted against their wishes. He told them to forgive him for the extreme step. The third note was addressed to his brother and sister,” said Choudhary. The police has recovered one Russian passport and other travel documents, including photocopy of passports of many Uzbeki girls. A team of police personnel guided by ACP Vikramajeet Singh received a tip-off that the absconding accused Laila, daughter of Umid Imomova, would visit NDSE part-II to meet somebody. Based on this information, a team was constituted to apprehend the culprit. Accordingly, a trap was laid and Laila was caught. The police was searching for her in a case registered in December 2008. This woman had been evading arrest, said senior police officials. The sustained interrogation of the accused revealed that she landed in India in 2005 on business visa. Soon her visa expired and she faced financial problems. At that time she came in contact with a group of Uzbek girls who were involved in flesh trade. Impressed by their lifestyle, she also indulged in the business. Initially, she herself used to go with the customers, but gradually she started arranging girls and organised her own module. Then she called her sister Umidda from Uzbekistan. Umidda developed intimacy with Rajneesh who ran taxi business in Delhi and soon all three were involved in the illegal trade. The entire exercise, held in association with the ICCI bank, was paperless. Thousands of credit card defaulters of ICICI Bank settled their long-pending cases and recovery suits at a series of paperless Lok Adalat. All proceedings were conducted online. The verdict was not binding on litigants. Supreme Court Justice Arijit Pasayat inaugurated the Lok Adalats at the Patiala House courts in presence of Delhi High Court Chief Justice Ajit Prakash Shah. “My case was settled within half an hour. I was waiting to get a no-objection certificate from the bank for the past five years. But today everything was materialised after I paid some amount. The bank representative has promised me that I will get the certificate at the earliest,” said Pritam Gandhi, a senior citizen who visited the Patiala House complex. But for some the Lok Adalat was not a good experience. “Two years ago I had taken a loan of Rs 5,00,000 from the bank and the bank had then asked me to pay a monthly instalment of Rs13,000. But today I realised that for the past few months the bank had been charging me Rs 16,000 and the judicial officer asked me to make the payment as directed. It is unfair and I will move court,” said Bhupendra Gupta, a resident of Ghaziabad, at the Patiala House court. A spokesman of the district administration said here that the darbars would start at 10 in the morning in presence of DGMs concerned in which complaints and grievances would be heard on first come, first served basis. All types of complaints of the consumers will be entertained and redressed at site in the darbars. The places for organizing the open darbars on February 15 are Customer Care Centre (CCC), New Colony Gurgaon, Operation Sub Division, South City Gurgaon, Bhoran Kalan, Sohana and Punhana in districts Gurgaon and Mewat, 33 KV substation Panjuwana, 33 KV substation old complex Ellenabad and 132 KV substation Odhan in district Sirsa. The Gas Authority of India Ltd chairperson U.D. Choubey inaugurated the CNG stations in the Surajpur area opposite Daewoo Motors and at Kasna near Honda Siel. Indraprastha Gas Ltd (IGL) managing director Rajesh Vedvyas and other officials were present.